I don’t know what happened yesterday. I can guess it was something terrible for some of my students and friends. I can guess (as a straight white person in America) the event wasn’t directed at me. I can guess it added new fear, new worry, to the unpleasantness that has been building, steadily, since the last yesterday. I do n’t know what happened yesterday. Maybe there was an act of violence that shook the world or just a community. A speech, a law, a movement made one of your students feel unsafe--or maybe all of them. One of the awful things that keeps happening happened again, and though I don’t know what it was, I can guess there will be resistance. We will chant what there is to chant, we will hashtag or retweet, bouncing noisy support into the echo chamber, knowing it’s the least we can do, that it is only barely better than not doing anything. I don’t know what happened yesterday, but I can promise you it will make its way into my classroom tomorrow. It will be carried in on the shoulders of my students, on the faces of my coworkers. It will be broadcast on the radio on my drive in, showcased on my laptop screen during lunch. 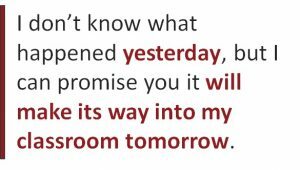 Whatever happened yesterday will be in my classroom, whether or not I talk about it, whether or not I teach about it. It will be there, and ignoring it won’t make it better. Awful things are happening, are leading to more awful things. We can’t ignore them. Even if we don’t understand every bit of how our students feel and fear what happened, we can give them space in school. Even if we can’t say what we are thinking—not really—we can protect the rights of our students to speak freely, to be fully human in our rooms. 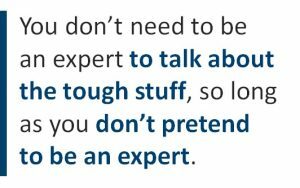 You don’t need to be an expert to talk about the tough stuff, so long as you don’t pretend to be an expert. Whatever happened yesterday, your students may need you sitting next to them far more than they need you standing in front of them. There is no neutral when people, any people, are told they don’t belong, are treated as if they don’t matter. There is no neutral when children are hurt. Whatever happened yesterday, we have to teach to it, we have to teach because of it. We must teach active acceptance and empathy. We must teach and resist; we must teach resistance. 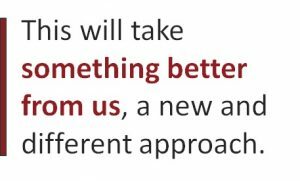 I don’t know what happened yesterday, but I know we are the front line to make it, somehow, better. At least for our kids, at least for that day. 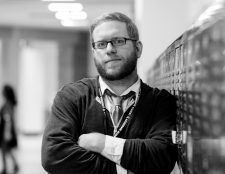 Tom Rademacher is the 2015 Minnesota State Teacher of the Year and a member of the National Network of State Teachers of the Year (NNSTOY). He teaches English at the FAIR School in Crystal, Minnesota. His book, It Won’t Be Easy, An Exceedingly Honest (and Slightly Unprofessional) Love Letter to Teaching, will be released this spring.